Ontario is at the beginning of a green transformation. Companies across the province are responding to the increasing demand for environmental goods, clean technologies, products and services. Our existing manufacturing base is “greening” its own operations, reducing the use of energy and water, and adopting more sustainable business practices and clean technology. Ontario’s communities and citizens are increasingly aware of their environmental footprint and are turning to Ontario’s environmental sector to help them live more sustainable lifestyles. The companies that make up our growing environment industry are poised to help our province make this important transformation - and this is the focus of EID 2010. 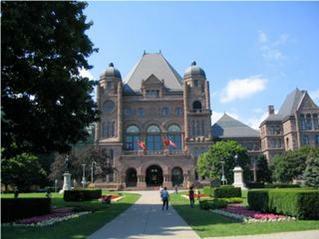 Meetings with MPPs: ONEIA schedules meetings with MPPs, cabinet ministers and opposition leaders throughout the day. This portion begins with a briefing session at Queen's Park, Committee Room 230 at 8:00 AM sharp and then teams meet with politicians throughout the day. Please note that while only ONEIA members can volunteer for these teams, the final selection of who participates in them is determined by the organizing committee to ensure that the teams are representative of our industry. Participation is limited to ONE participant per company. Brownfields: What impact will new Brownfields regulations have on developers, consultants and financial institutions? Can the Government of Ontario maintain its smart growth agenda in light of the more stringent standards and stricter rules? Water and wastewater: What might the province’s new water agenda look like? Where might it go, and how can industry contribute? Green Energy: Ontario is leading North America in its approach to green energy – but how is the Green Energy Act rolling out? Are we looking at fine-tuning? How is the FIT program being received? Modernization of approvals / open for business: How is the Ministry of Environment’s ambitious modernization process going? What key changes can Ontario environment companies expect in coming months and years? Air and climate change: How might we move to a federal/Ontario cap and trade system? How are air approvals issues playing out within MOE – and can we look for any changes on this front? Waste Diversion: Industry and the province are grappling with a range of waste issues – what will the coming year bring for approvals, extended producer responsibility and the recent white paper on zero waste? Evening reception: ONEIA members and nonmembers gather from 5:00 to 7:30 PM in the Queen's Park dining room for a reception hosted by the Mniister of the Environment. This reception is generally attended by dozens of politicians, senior staff, cabinet ministers and prominent figures from across our industry. Register now, as we expect this EID to sell out quickly! PLEASE NOTE: ONEIA members, after they complete their registration, will receive a separate e-mail from our event manager asking them which parts of the day they would like to participate in. A limited number of sponsorships are available for the day. To discuss these opportunities, please contact Caroline Aston at caroline@astonevents.com.